Australia’s most cosmopolitan and populous city may not be the most obvious whisky destination, but it boasts a huge variety of attractions for the seasoned whisky lover – you just need a good local guide to show you around. Sean Baxter reports. You might not think that Sydney would be a global destination when it comes to whisky. After all, you couldn’t really get any further away from the frigid burns and frosted highlands of Speyside than sunny Sydney in summer. But the city boasts a veritable smorgasbord of Scotch whisky options hidden in plain sight – you just need to know where to look. Whether you’re a casual international visitor or an unwary local, let’s open a window on some of Sydney’s best whisky experiences. It wouldn’t be right to start off a Sydney whisky adventure without a visit to the first whisky distillery to open in Sydney for over 100 years, Archie Rose. Situated in Rosebery (only five minutes from the airport by car), the distillery features three copper pot stills – two for whisky and a smaller one for gin. What makes Archie Rose unique is the distillery tour. Unlike many others, Archie Rose allows you to taste and smell your way through the entire experience. This includes the wort, the wash, the low wines and the new make spirit. It gives the whisky enthusiast an incredible insight into the various production methods that manipulate flavour. After the tour, you can retire to the award-winning bar, where the spirits on offer include vodka, gin, white rye and many other ‘curiosities’ that are awaiting their final few months of maturation. The Scotch whisky selection on the back-bar is also something to behold, with a plethora of rare and limited releases available to purchase by the nip or the half measure. The Kirketon Hotel, located just a short stroll from Kings Cross in Darlinghurst, is a very affordable accommodation option. But it’s the bar at the back of the hotel lobby that creates all the excitement for whisky lovers. Eau De Vie has won every award going and has a whisky collection that has to be seen to be believed – it even has its own room, housing several hundred whiskies from all over the world. The only danger is that you can charge your drinks to your room, which may set you up for a nasty surprise at check-out if you thought you might sample a few Brora 35-year-olds at the end of the evening. Head into the city to the Four Seasons for a slightly more lofty accommodation experience – located right on Circular Quay with incredible views of the Harbour. However, one of the best sights isn’t outside the front door, it’s inside the dedicated whisky bar, called Grain. Boasting a collection numbering well into the hundreds, Grain not only features a fabulous line-up of single malts and blends, but also an extensive list of Japanese and Australian malts. It’s been named best hotel bar in Australia, so is worth the visit even if you’re not a guest of the hotel. It wouldn’t be appropriate to visit Sydney without a trip down to the Harbour to admire some of the world’s most amazing landmarks. And what better place to do so than within the Opera House itself? 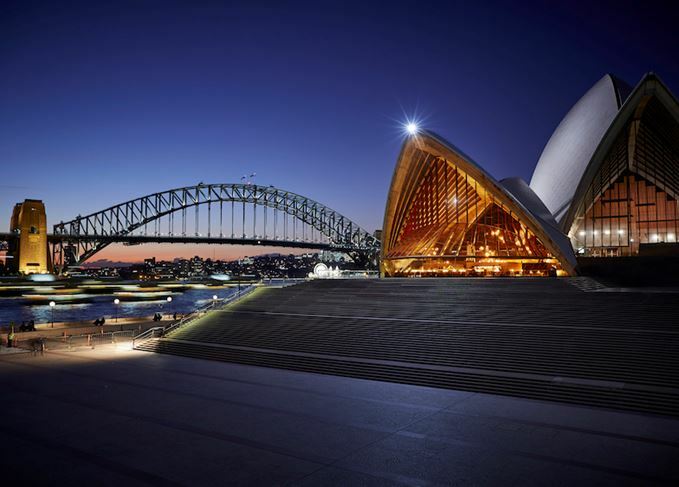 Bennelong is a two-hatted restaurant situated within the smaller preliminary sails of the Opera House precinct. The bar within the restaurant is small, but its whisky collection has some pretty heavy hitters. Order the cheese board and sit down with something old and rare; the window seat gives you one of the best views of the Harbour, and it’s somewhat overlooked when it comes to the great imbibing spaces of Sydney. If great views are what you’re after, head over to Hotel Palisade in the historic Rocks precinct and visit rooftop bar Henry Deane (try to avoid it on the weekends – with the astronomical view comes an astronomical waiting list for a table). Find somewhere to sit and order some lunch, perhaps with a little Whisky Sour as an aperitif. When you’ve finished eating, there is a healthy selection of single malts to accompany sensational views across greater Sydney. And, if one Sour becomes several, you can always stay the night in the boutique hotel. Baxter Inn in Clarence Street is your quintessential back-alley bar, found by navigating side streets and dimly-lit stairwells. Well, that used to be the case, but now it’s so popular, there’s nearly always a queue (which might have something to do with being named one of the best whisky bars in the world). The shelves of whisky extend from the bottom of the back-bar all the way to the roof, seemingly a staircase of single malts as far as the eye extends. The polished letters of the now infamous and much mimicked whisky board call out hit after hit from an ever-changing line-up. They even have a private whisky dunnage where you can sample some of the most rare (and expensive) whiskies in the world under the tutelage of an in-house whisky specialist (aka probably whoever is bartending at the time). Stepping into Hubert in Bligh Street, down the winding spiral staircase lined with shelves of miniature bottles, you’d be forgiven for thinking you’ve stumbled into a post-war French salon. The sultry crooning of Edith Piaf drifts up to meet you, as does a cacophony of different scents and sounds. Everything on the menu is dripping with fun and flavour… and butter, a mountain of butter. While the drinks menu is filled with glorious wines and cocktails, they stock a handy amount of whisky as well. Best bet is to prop yourself up in Bar Normandy with a Manhattan and some chicken parfait and pick your way through the malts selection. Hint: they all go with the parfait. Tokyo Bird in Surry Hills certainly ticks a variety of boxes for the avid whisky drinker. Here you will find Yakitori, Japanese beer and, of course, Japanese whisky galore (plus some Scotch for good measure). Surprisingly, you can still find a healthy range of Yamazaki and Hakushu malts being sold here, especially considering the whole world is trying to get their hands on some right now. Unsurprisingly, be prepared to loosen the purse strings, but it’s rare to find such a great selection, supported by some of the world’s best bar snacks. Try the Yamazaki Sherry Cask with the chicken skin yakitori. All the best bar food comes on sticks. There are plenty more options to choose from, not necessarily dominated by their whisky collections, but where you’ll be guaranteed a fabulous time anyway. Kittyhawk is in the financial district and is a nod to wartime Australia. There’s a cocktail called a Nuclear Daiquirye – a hectic recipe that combines Archie Rose 55% rye spirit, overproof rum, Chartreuse, fresh lime and Falernum. Don’t have two if you want to remember how to get back to your hotel. Just down the road is Rock Pool Bar and Grill, where you can grab a burger and malt whisky to match. It is a Sydney institution and serves some of the best steak in town. The Clock Hotel in Crown Street, Surry Hills, has a great hidden whisky room in the back of the pub, which is seemingly still one of the best-kept secrets in Sydney’s whisky scene. Finally, Earl’s Juke Joint is out in Newtown, one of the most exciting suburbs on the outskirts of the city. ‘Earl’s’ is one of the greatest bars in Sydney, with bartenders slinging tinnies of local lager and Irish whiskey at a crowd moving as one to the hip-hop and general good times the place seemingly generates. Scotch featured heavily in the crime author’s works, including The Maltese Falcon and Red Harvest.